U.S. Vice President Mike Pence speaks during a news conference at the ASEAN Summit in Singapore, Nov. 15, 2018. The United States flexed new muscle in Asia Thursday with pledges to counter China’s expansion in a contested sea and set up a second summit with the leader of North Korea, which Washington regards as a military threat to Western allies. “We all agree that empire and aggression have no place in the Indo-Pacific,” U.S. Vice President Mike Pence told the U.S.-Association of Southeast Asian Nations (ASEAN) summit in Singapore. “One thing President Moon did tell me that he believed, as President Trump believes, is that Chairman Kim wants to do something very significant here,” Pence told reporters in response to a question from VOA Thursday. Pence is attending the ASEAN 2018 Summit, an annual gathering by heads of state from 10 Southeast Asian countries. Members Brunei, Malaysia, the Philippines and Vietnam claim parts of the South China Sea – a waterway contested by Beijing, which has landfilled and militarized islets over the past decade. His comments on the South China Sea were likely aimed at reassuring Southeast Asian countries that it would keep Beijing in check, said Eduardo Araral, associate professor at the National University of Singapore’s public policy school. China has rattled other claimants by landfilling and militarizing some of the sea’s once uninhabited islands over the past decade. China has offered loans and aid for infrastructure throughout Southeast Asia – some believe to stop recipient countries from challenging its maritime expansion. Washington probably plans to send more navy ships to the sea to show it’s open to all countries, Araral said. China usually protests those moves. 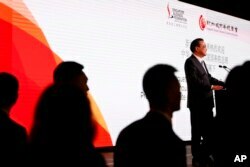 “Given the impact of the South China Sea issue on the smooth development of relations between China and some ASEAN countries, we all made active efforts to overcome this potential hindrance,” Li said at the China-ASEAN summit, as quoted by Beijing’s official Xinhua News Agency. Playing to Southeast Asia’s quest for stronger external trade links – an area Pence said little about this week – Li expressed support for the Regional Comprehensive Economic Partnership, a trade liberalization pact led by ASEAN. The deal that includes economic powerhouses China and India would cover one-third of the world GDP. The U.S. government opposes multi-country trade deals. “We look forward to the early and substantive conclusion of negotiations on the Regional Comprehensive Economic Partnership that contributes to the building of more robust and effective supply and value chains in the region,” Li said. Russian President Vladimir Putin is leading a delegation to the ASEAN summit this week to vie with other powers for business opportunities in fast-growing Southeast Asia as his homeland’s fuel-reliant economy struggles. 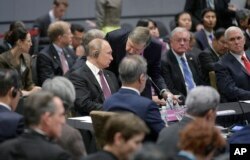 Putin described as “useful” his delegation’s role in a summit investment forum, according to the Russian news agency TASS. Russian technology might find a market in Southeast Asia, Song said. Russia-ASEAN trade grew 35 percent in 2017. Putin “envisages” nearly 60 joint projects in Southeast Asia under a “roadmap of business cooperation,” TASS said.